1. 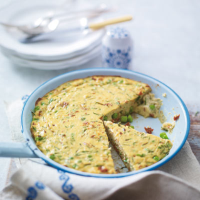 Mix together the eggs, breadcrumbs, peas, chives, garlic, Parmigiano and tomatoes. Finally, fold in the ricotta but don’t worry about beating out all the lumps. 2. Heat the oil in a 23cm non-stick frying pan and pour in fixture. Cook very gently for 10-12 minutes until almost completely set. 3. Place the pan under a medium grill for a further 5 minutes until golden brown and completely cooked through. Slide the frittata out onto a board, slice and serve with rocket leaves. Save time by using a 155g pack of Waitrose Popped Garden Peas.